Since it was the week to learn about H and 8, I decided to focus on hats. As I was preparing, I checked out a great stack of books about hats, hoping that one of them would be the perfect lead-in for the day and provide a good framework for the lesson. 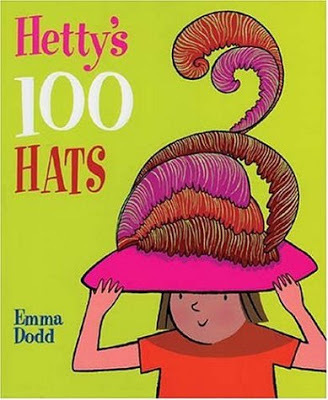 After reading Hetty's 100 Hats, I knew I'd found it. It was just what I was looking for! Hetty is the proud owner of three hats. She loves her hats and is grateful they keep her dry and warm and safe from the sun. But Hetty is also a girl with a dream. She wants to collect 100 hats. She attacks her goal with a vengeance and creativity. She turns household items into hats, she makes her own, she accepts all the leftover hats from her school's hat parade, and friends and even strangers bestow them as gifts. On her birthday, she is just one hat shy of her goal, but luckily her brother saves the day. 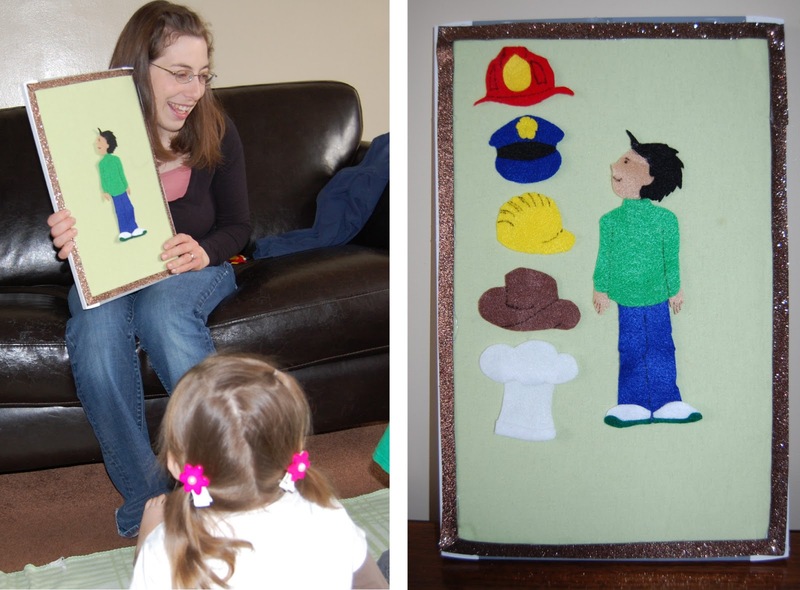 I thought this story taught so many good things: setting a goal and working towards it, how to count to 100, all the different professions and types of people who wear hats, coming up with creative solutions to problems, and using a collection to make new friends. As usual, I loved Emma Dodd's simple illustrations. Our favorite pages were the ones showcasing all 100 hats--it was so fun to look through and count them all! 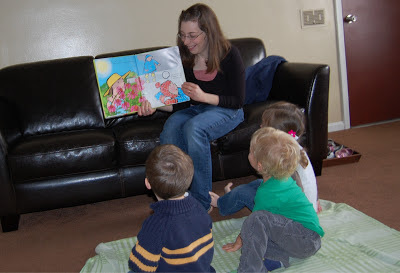 When the kids arrived, I spread out a blanket and read the story to them. They loved seeing all the ways Hetty acquired her 100 hats. When the story was finished, I asked the kids, "How would you like to have a hat parade, just like Hetty?" (In the book, everyone in Hetty's class at school made a hat and wore it in a parade.) Max and his friends thought that was an excellent suggestion. I had asked the other moms ahead of time to send their kids with one or two hats, so they all had a variety to choose from. I put on the song "Marching Feet," which had just the right rhythm and beat to make it the perfect parade song. The kids marched all over the house. They took turns being the leader, and we all made a hat change partway through. After the parade, we went to kitchen for another Hetty-inspired activity: making newspaper hats. At the very end of the book, Hetty needs just one more hat to complete her collection. She receives a birthday letter from her brother who suggests she make a hat out of a newspaper for her collection. Do you think we could possibly read about that and not want to make one ourselves? We could not. I folded up the hats for them and then let them decorate to their heart's content. We used foam letter H's (H for Hat, of course), paint markers (which made some fun-sized dots), and regular markers. Their hats all turned out so cute. For some reason, newspaper hats just give me such a feeling of nostalgia. I think I did make them a couple of times when I was little, but more than that, they just seem like such a classic thing for a kid to make. They're something that kids were making in 1913, and they're still making them in 2013! By this time, all of them were very hungry. In keeping with our hat theme, I helped them make pilgrim hats (remember, this was in November). I don't dare mention the quantity of frosting, cookies and Reese's they consumed. It was a frightful amount. Hats are also a great way to talk about various jobs and careers. I was dying to use my flannelboard again, so I told them the story of Simon, a boy who couldn't decide what he wanted to be when he grew up. Should he be a firefighter and save people from burning buildings, a chef and make delicious desserts, a cowboy and ride a horse, a policeman and keep people safe, or a construction worker and make buildings and roads? For our last activity, we went back to the kitchen to talk about the number eight. I pulled out the play dough, which we shaped into the numeral 8. We also rolled out little balls and counted up to eight. And then we squished it and mashed it just for fun. It was a fun way to spend the morning. I love teaching these little kids! I shared this post at The Children's Bookshelf and the Kid's Co-op. OMG OMG OMG what fun. I love it. A hat parade! Hat cookies! Adorbs. Looks like you had a great day and came up with a lot of fun learning things the kids enjoyed. I love these activities! I have two preschool boys. It sounds like they'd love these projects. They are active and involve sweets, what's not to love. Thanks for sharing the book and the activities. Jackie, thanks so much for coming by! If your boys are anything like my boys, then they will definitely like these activities! This looks like soooo much fun! I also see that you are reading An Enormous Egg! We love that book. Thanks for sharing at The Children's Bookshelf. We're almost done with The Enormous Egg, and my boys have absolutely loved it. I think it was actually you who reminded me of it, and so then I picked it up when I was at my parents' house over Christmas. This is so much fun!! But then I clicked on all of your links and fell down the rabbit hole of all the activities in the world to do with kids. Ha! I appreciate moms sharing ideas like these. Also love that felt board! !